Electrical Wiring | Anderson Electric Corp. 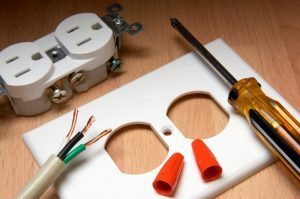 If you’ve looked around for an electrical contractor to help with your house—whether for electrical repairs, installations, rewiring, new indoor or outdoor lighting—then you’ve probably come across mention of “keeping a house up to code” and “the electrical code.” You’ll recognize this means keeping a home up to some sort of safety standard, the same way food service establishments must stay up to state and local health codes. But what exactly is the electrical code? Posted in Electrical | Comments Off on What Is the “Electrical Code” I Keep Hearing About? A lot of people don’t spare much thought for the wiring in their walls. They want their wiring to be safe and efficient, of course, but as long as they don’t have an obvious short circuit or an actual fire hazard they tend to not think about their wires at all. Electrical wiring is not one of those things that you need to have replaced on a regular basis. It doesn’t even necessarily need to be done every decade or so, the way HVAC systems should be. However, there are some times when it’s a very good idea to have part or all of your home rewired. Let’s go over when it’s a good idea to schedule electrical rewiring for your home below.